One of the nicest thing in this place is probably the great terras in front of the restaurant, where it's wonderful to sit in the summer to enjoy the cool evening breeze. You can also sit on the pleather like sofas inside the restaurant. It's recommended to make reservations beforehand. The menu is quite various but you can't be too picky. They serve decent portions of pasta, green salads, hamburgers and chicken. If you don't feel like eating too much, but you want to feel full, order the pasta or salad. The hamburger is not too bad, but we know other places where they serve the best burgers in town. For those who want to be really full, we recommend to eat the sweet and spicey chicken wings, which are served with a small green salad and fries. 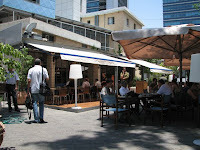 You can finish with their creme brulee, which is one of the best in Tel Aviv! This semi-modern decorated restaurant is located at Dubnov 8. You can get to the street from Daniel Frish st., which is connected to Iben Gvirol (south of the London Ministore).